All along, people of Sri Lanka knew whose creation Bodu Bala Sena (BBS) was. No one was surprised when Gnanasara announced his support for Mahinda Rajapaksa (MR). Instead of worrying about BBS’ support for MR, those who wish a change were jubilant for the fact that BBS support for MR was a blessing in disguise for the opposing forces. With due respect, this writer would like to call the leading figure of BBS, Gnanasara Unnehe, instead of Gnanasara Unnanse although the subtle difference in the meaning of the two terms can only be attributed to the practice rather than to linguistics. I must admit that I am a Buddhist by default. I do not worship monks or do not go to temples to worship. Yet I like the serene atmosphere of a temple and grandeur of the buildings. I believe I am a good Buddhist nonetheless, because I have enormous respect for the Buddha and his preaching about how to lead a good life and I lead a reasonably generous, magnanimous and peaceful life without causing any harm to anyone. As far as Gnanasara Unnehe is concerned, people have qualms about as to whether he is a monk or a layman in a yellow robe. His physical gestures, abusive language and mannerisms are neither of a sage nor of an ascetic but of an ordinary thug. He was alleged to have been penalized in a court of law for drunk driving. He has tried to justify this ‘unmonklike’ behaviour in patriotic terms claiming that he accepted the blame of drunk driving to prevent an important security forces person from falling into trouble. However, he himself had admitted at a TV interview that there are many females interested in him and one even stalked him in the recent past. Judging by his personal behavior and evil traits, it is hard to believe that Unnehe would reject an offer from a good-looking female. Lastly the type of Buddhism that he wants to nurture in Sri Lanka is so violent that it defeats the purpose of the core of Buddhist Principles that are nonviolence and the tolerance of other religions. The Buddha has said those who do not respect religions of others do not respect their own either. In a recent press conference Unnehe has said that for him the country, the nation and the religion are the most important things in his life in that order. By the country he means an undivided Sri Lanka. I guess this is his sincere desire, and no disagreement with this. However the desire to have an undivided country under the Rajapaksas, at any cost, is questionable. In his opinion if MR is defeated at this election the enemy forces would take him to an international court to try for his misdeeds. He quoted a certain person of Tamil ethnic origin who has said something to that effect at a TV interview. This one person who does not possess any international power has been drawn on as the main conspirator who allegedly has gathered all opposition parties to help his conspiracy. If there is any international conspiracy to overthrow MR at this Juncture, MR must be the lead role in that conspiracy because he himself alone wanted to hold elections in January 2015. No foreign government, agency, person or a pressure group has pressurised him to do so. Opposing parties within the country have not only opposed the premature election but have even threatened with legal action. Yet MR has decided to go-ahead with the election having received the green light from a Judiciary that he himself has appointed. Instead of ruling happily for two more years he has announced an election. Now he has got all his henchmen to call the emergence of a strong opposition a conspiracy. If he feared that he would be tried at an international court, he would not have declared an election. The claim that he would be tried at an international court is only an election gimmick. Rajapaksa opportunism seems to have backfired and he does not know what to do now other than trying his usual tactics to deceive the public. According to Gnanasara Unnehe the people of Sri Lanka should go on electing MR or one of his family forever for the fear of them being charged with war crimes, despite the bad governance, criminal activities of his close associates, increasing lawlessness in the country and escalating poverty among the poor. 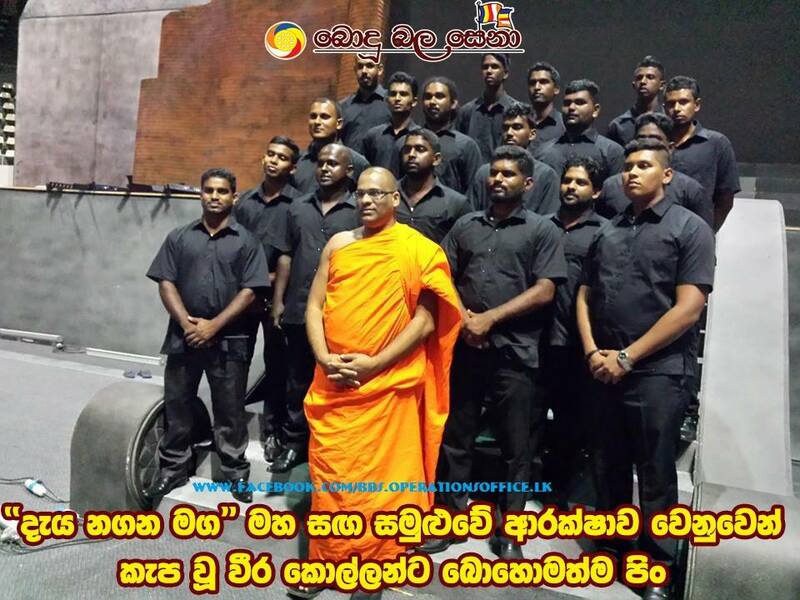 As far as I am concerned, Gnanasara Unnehe’s nation is not Sri Lankan but Singhalese, his religion is not Buddhism but some philosophy that is full of hatred and divisiveness. So I hope that the people will know the difference between the truth and a lie and a good monk and a bad one. Indeed a blessing in disguise! BBS is left with no option. In the height of BBS actions they were projecting as if they are the 3rd force in SL political scene. That is because they had the backing of the corrupt regime. Now that the political land scap has changed BBS is a liability. Surely opposition is not foolish to accept this virus in to their fold. A common opposition came in to action to defeat such acts by MR Regime. On the other hand for MR must be cursing himself for the predicament he has got himself in to. what goes around comes around! MR has dug his own grave. What I can say is all this is a part of a bigger plan. Medamulana MaRa and cronies Follow Mara to harass the people. So, it is Natural for the TWO Mara Followers, BBS and Medamulana MaRa to get together. I thought Gnnanissara and his Bodu Bala Sena wanted to back CC Sira. and had lengthy discussions with him. Sumane are you saying Nana Unnehe had lengthy discussions with Mithripala Sirisena? A good decision by BBS to support the present incumbent president and naturally they have to serve their own masters with their understanding of the religion and the way to practice same. A strategy most foul by MR’s regime was to allow the BBS to spread communal hatred. MR and his band of brothers should know that all the pain they have brought people in their 9 year rule will disable them from the corrupt and undemocratic practices of governance on the 8th of Jan. “Birds of a feather flock together” MR, BBS, Gota , Basil and their families can flap together for their rest of their lives and leave us in peace. What a relief that the BBS was rebuffed by Maithri. A great start to his campaign. BBS thug and minority hater, did the opposition a great favor, when he was rejected by them, and went back to supporting those who protect him. They are all peas in a pod. They deserve each other. All scum. MS does not need such rabble rousers and inciters of violence against minorities to stain their campaign. That belongs to the rajapaksas. Birds of feather flock together. Fnally a very good combination. Gota, MR, BBS Gnanasara, Kelani Mervin and his son Malaka, Kolonnawa Duminda, Julampitiya Amarae, Thangalle PSC, Karuna, KP, Pilliyan and our famous Sajin Vaas Gunawardena. Who let the dogs out……Somarama re-visited. Well come back BBS to DisneyLand. Doesn’t the army of Brown Shirts standing behind the Cardboard Sando Gnanasara remind you of the Brown Shirts of Hitler’s Stormtroopers, responsible for their Krystallnacht etc. that destroyed a whole nation? In the present climate, I’d say not having the Cardboard Sando on your side would indeed be a blessing as every time he speaks, it must be costing hundreds of votes lost. My earnest wish for the Rajapakses not to get elected is, besides the safety of our nation, let them face the consequences of the UNHCR investigations in their own bunkers instead of dragging the whole country to face the inevitable sanctions. The effect of fuel shortages is devastatingly serious to contemplate, I pray it does not happen.